Finding an ice fishing shelter with the optimal components to adhere to your particular ice fishing methods can be difficult if you do not know what you are looking for. If you are an advanced ice angler then without a doubt you need to see all of the versatile shelters that manufacturer, Clam has available. Featuring the latest thermal technology, Clam ice shelters use Full Thermal trap skins that create a warm oasis for anglers who are even in subzero temperatures. The key to purchasing a Clam ice shelter is picking the one that molds to any angler’s needs. Whether you are a novice or an advanced angler, Clam has an ice fishing shelter in their arsenal that observes any features that you might find useful. Each model of the Clam ice shelter lineup has key components that make them unique from the rest. When it comes to the two most versatile Clam Ice Shelters that appease anglers with skill level across the board it is definitely between the Clam 9130 Big Feet XL400T and the Clam 9735 Six Pack. In a side-by-side comparison, the two ice fishing shelters are very similar, but they have some keen differences that makes one of the models the best universal ice fishing shelter that Clam has. The Clam 9735 Six Pack can fit 5-7 anglers comfortably, while still maintaining the important features of the other models. The Six Pack’s durability is what really makes it very popular. Although the Six Pack is quite large at a 94 square feet fishable area, the Six Pack stays true to its name and packs easily. The Clam 9735 Six Pack also has a Full Thermal Trap skin for insulation that could battle even the harshest winters. The Clam 9130 Big Feet XL4000T is nice and roomy and fits 4-6 anglers very comfortably. After taking suggestions for improvements from the previous model of the Big Feet, Clam decided to add a lot more head room, increasing the comfortability. The Big Feet XL4000T Clam Ice Shelter also has 11 mm, super-duty, flex tested poles and an oversized skirt, as well as extremely sturdy ice anchor straps and strap pockets for the times when your ice fishing shelter is overtaken by extremely windy conditions. Partnered with the oversized skirt for snow banking and oversized carrying bag for easy repacking, The Clam 9130 Big Feet XL4000T is the best choice for a versatile angler of any skill-level who wants a Clam ice shelter that will last them years and cater to their every need. This Clam ice shelter gets consistently good reviews. Clam has an impressive assortment of ice shelters to choose from besides those two. Ranging from every creed of angler, there are plenty of other ice shelters to choose from. The key to finding the ice shelter for you is dissecting the features of each model and figuring out which one best fits your needs as a ice fisherman. The Clam 9130 Big Feet XL4000T is perfect for those anglers who prefer a little extra room in their shelter for extra ice fishing gear and plenty of headroom, so you can have a family ice fishing expedition or invite some of your fellow anglers to join you in the ice fishing shelter. As mentioned before, the Clam 9130 is also the most versatile model with many extras that come with it, including heavy-duty flex tested poles and ice anchor straps for wind resistance. When it comes to group ice fishing then the Clam 9735 Six Pack is definitely the prime choice if you are looking for a hub style fishing shelter. Fitting from 5-7 anglers, to say the Clam 9735 Six Pack has an ample amount of room is an understatement. This grandiose model is not as heavy as you would think, with the Clam 9735 Six Pack coming in at a mere 63 lbs. The 9735 Six Pack also has the trusted Full Thermal Trap technology to truly combat the freezing ice fishing temperatures. Easy to set-up and pack-up, this low maintenance hub is definitely a great choice. Check out more reviews. The Clam 9710 Kenai Pro is the ice fishing shelter for the loner anglers out there who enjoy solo ice fishing trips. The Kenai Pro is a 1-person fishing shelter that has plenty of room for yourself as well a lot of equipment. The original Kenai shelter received so much praise that Clam decided to add a few more features, to make it as useful as possible to pro anglers. For us gear-toting anglers, Clam added a corner console for storage of all of your gear and accessories. In addition to those features, the 9710 Kenai Pro has a tub and adjustable folding seat for ultimate comfort. See more reviews. The Clam 9102 Six Pack is just like the newer model, only it doesn’t have that intensified thermal technology. However, it is still easily packed and unbelievably affordable compared to the competitive market of ice fishing shelters. See what others have to say. If you are an ice fisherman that enjoys the company of one other person with you then this 2-person ice fishing shelter is for you. The Clam 9714 Nanook has complete ease of use with an instant set-up that one person could do easily. Clam ice shelters always deliver with their extremely light weight huts and the Clam 9714 Nanook is no different. Ice fishing can be a long and tedious process, which is why the Nanook features padded seats on their two included seats to ensure back support. The two seats also have swivel technology for prime movability during an ice fishing session. We found a couple of other reviews for your to check out. The Clam Bigfoot XL2000 has the coveted Thermal Trap Technology for the ultimate portable hot box. The Big Foot XL2000 differs from the XL4000 model because it slightly differs in size, where the XL4000 fit up to 6 anglers, the XL2000 fits up to 5. Both models are both very large with 30% more interior space versus the competitive models. This Clam ice shelter also receives high marks. As expert anglers who specializes in large catches, we personally like the Clam 9130 Big Feet XL4000T model the best because of the massive range of features, as well as the amount of space it has. However, as you can see, Clam has plenty of high-quality models for anglers to choose from. If you love fishing in the cold, you must have an ice fishing shelter. And if you would like to bring a few friends along, you’ll certainly want to get the best Eskimo ice fishing shelter possible. An ice fishing shelter refers to a portable hut placed on a frozen river or lake to give protection during ice fishing. Below, you’ll find our Eskimo Fatfish 949i review. Every angler has their own preferences. Most fishermen enjoy camp style fishing – sitting in a cozy portable ice shanty with their friends or family, eating, sharing stories, and playing cards. The portable ice shelter is a good choice for those anglers who like to move around on the snow, but at the same time stay protected from the cold. There are several variants of ice fishing shelters available in the market and selecting the best one can be daunting some times. Here are some factors you must consider while choosing the best ice shelter that meets your needs. Type: What is your ideal type? Do you prefer cabin style or a flip-up tent? Capacity: How much space do you really need inside the ice shelter? Storage: How much space do you need to store your equipment and gear? Weight: Do you intend to carry your shelter and move it around a lot? Portability: Does the Eskimo ice fishing shelter need to fit into a car or are you willing to tow it? Denier: Do you prefer nylon or polyester fabric? All things considered, a pop-up portable Eskimo ice fishing shelter is a perfect choice if you consider yourself a passionate ice angler. Eskimo ice shelters are some of the best portable ice houses available in the market. Eskimo ice shelters keep the wind and snow out of your fishing spot and help with heat retention. Let’s take a closer look with our Eskimo Fatfish 949i review. 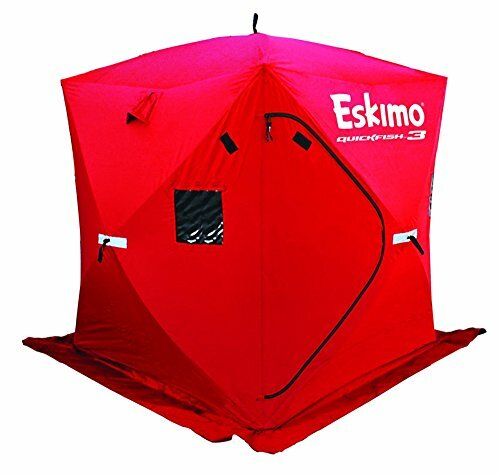 The Eskimo Fatfish 949i pop-up portable ice fishing shelter offers a unique hub design, reliable YKK zippers, ice anchors that do not bend under heavy pressure, and quality fabric for heavy-duty durability and the lifespan you need, even in harsh winter conditions. The Eskimo Fatfish 949i comes with the set-up dimensions of 4x94x80 inches and features 6 large removable windows. It is capable of accommodating up to 4 persons. The Eskimo FatFish 949i gives you 80% more fishable area than other ice shelters in its class. It features an extra insulated layer to protect you from the freezing cold. The Fatfish 949 utilizes and IQ insulated fabric which gives the fisherman 35% more warmth in the harshest of conditions. This pop-up shelter features rugged, durable fabric that can withstand the elements and protect you from the toughest weather condition. Its high-quality YKK zipper prevents cold and the wind from penetrating the ice hut. During out tests with this great ice house, we stayed cozy and comfortable the entire time. The Eskimo Fatfish 949i shelter also features self-tapping ice anchors which we found easy to grip and they never bent under pressure. According to Eskimo, their IceTight fabric has a 59% higher thread count that results in a tighter weave, and therefore offers complete protection against wind and water. The strategically placed door offers more space inside the ice hut. This portable ice shelter fits into an over-sized duffle bag that can be easily toted around. It offers enough space to store all of your essential fishing gears. We found space to be more than adequate. The Eskimo FatFish 949 comes with two doors on the opposite sides of the ice shack to allow fishermen easy in and out access. The Eskimo Fatfish 949 is without a doubt a top choice when it comes to ice fishing shelters. If you are looking for an Eskimo ice fishing shelter, you won’t be disappointed with the Fatfish 949i. We hope you have found our Eskimo Fatfish 949i review helpful. The best ice huts for sale will likely come from either Eskimo, Frabill, Otter or Clam. Having the right gear can make ice fishing far more enjoyable. Ice shelters that are reliable can easily extend the amount of time that you can and will want to spend ice fishing. Choosing the best ice shanty available can help you to get the most out of the season. Ice house reviews are a great way to get started with your evaluation for which ice shelters are best for your needs. There are some things you should consider before you make your choice. Clearly one of the criteria as to what makes an ice hut best is the amount of weight that it carries. The best ice fishing shelters for sale are portable, durable and easy to transport. Not all ice house models are meant for easy mobility. It can be enticing to rush out and buy the biggest ice house you can afford but bigger is not always better as a matter of fact size in fact does not always matter! Mobility is a very important factor if you want to be able to fish at more than one hole. If you go too big or too heavy you wind up stuck in one spot and unable to easily move to a new spot. Weight matters. Eskimo and Otter manage to keep their ice huts nice and lightweight. The best ice huts for sale are typically made from polyester or nylon. Both materials can be adequate for ice house construction but you do want to choose a heavy “denier” which is the weight of the material that covers the ice hut. The heavier the material the more durable and resistant to tearing it will be however the heavier material options will be heavier to carry and move. Of course the heavier material options are more expensive. You can easily find a medium weight denier ice hut that can meet your needs, fit your budget and fit your style. The best ice huts for sale have comfortable seats. Many of the models that are available have very comfortable seating. When you consider that you will be seated for much of the time that you are ice fishing it makes sense that the seating should be comfortable. Some of the best ice huts for sale are inexpensive but there little extra comfort features make them the best ice huts. Being comfortable includes being in an ice house that is going to keep you warm. You can buy a model that is made of thermal materials that will really help to protect against the wind and the cold. You will pay a little more but if you can find an ice hut that is made of thermal material that has comfortable flip down seats and that is lightweight that would be one of the best ice huts for sale. Once you fall in love with ice fishing it can be hard to restrain yourself. A lot of people make the same mistake by buying ice houses that are far bigger then they need because they have plans of getting everyone they know into ice fishing. When buying your first ice hut go with a conservative size to get started, you can always trade up later on once you know what your real need is going to be. Ice fishing is a great sport and picking from the best ice huts for sale can make the sport so much more enjoyable.